Established in 1998, MEGA AUTOMOBILE has grown to become the number one used volume dealer in Eastern Ontario and Western Quebec. MEGA AUTOMOBILE has the largest selection of premium used vechiles at the lowest prices guaranteed, they make it easy, price plus tax no other fees. Over 800 vechiles on the lot to choose from, big volume and big savings, save up to $3,000.00 over the competition. Throughout our tenure we have strived to include the best possible customer service with top-notch repair/maintenance work and comprehensive new and used car, truck, minivan and SUV inventories. MEGA AUTOMOBILE was founded over 10 years ago by Nader Dormani owner of the Dormani Automobile Group. 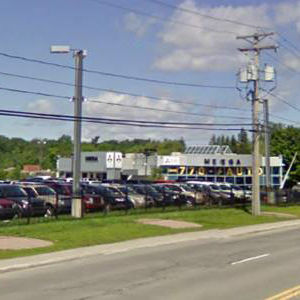 Based in GATINEAU, MEGA AUTOMOBILE has continued to expand as it now serves all of the greater Gatineau / Ottawa region with new Mitsubishi vechiles and used automobiles and trucks. Over the years, MEGA AUTOMOBILE has grown in its current location, as we now offer a state-of-the-art showroom, Parts & Service Centres and a Finance Department. Whether you are in need of a new Mitsubishi automobile or parts / service for your current vehicle, MEGA AUTOMOBILE of GATINEAU is here to assist you with any of your automotive needs! At MEGA AUTOMOBILE, we look forward to serving you, our valued customer, for years to come. Please stop by our dealership, located at 1261 ST. JOSEPH BLVD., GATINEAU, Quebec and speak with one of our bilingual representatives today!